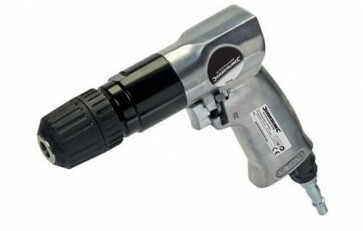 Brand New Reversible Air Drill Reversible air drill with 10mm keyless chuck Side-mounted forward/reverse lever for one-handed operation and muffled handle exhaust. Includes both UK and European 1/4" quick connectors. No load speed 1800min-1. Air consumption 140L/min (5cfm).